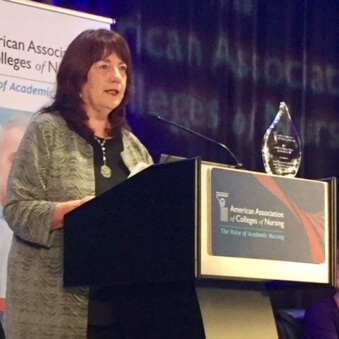 Susan Reinhard, PhD, RN, FAAN, senior vice president and director of the AARP Public Policy Institute and chief strategist of the Center to Champion Nursing in America (CCNA), has been honored as the 2017 recipient of the Lois Capps Policy Luminary Award by the American Association of Colleges of Nursing (AACN). The award recognizes an outstanding nurse each year whose work in public policy has made significant and lasting contributions to the nursing profession. Reinhard is a nationally recognized expert in health and long-term care policy, with extensive experience in conducting, directing, and translating research to promote policy change. She directs AARP’s Public Policy Institute, the focal point for public policy research and analysis at the state, federal, and international levels. She also serves as chief strategist at CCNA, an initiative of AARP, AARP Foundation, and the Robert Wood Johnson Foundation and a national resource center created to ensure America has the nurses it needs to provide care in the future. The awards ceremony was held October 31 in Washington, D.C., at AACN’s 2017 Academic Nursing Leadership Conference (formerly Fall Semiannual Meeting). In the formal presentation, Reinhard’s accomplishments in the health care policy arena and her work as a change agent for the nursing profession, patients, and families were highlighted, as well as her efforts to promote preventive and community-based care. The award was established in 2009 and renamed in 2016 in honor of Rep. Lois Capps, a registered nurse who took her passion for policy to the United States Congress, where she represented her California district from 1998 to 2016. She retired after serving in the 114th Congress. Among her contributions as a policymaker was the Registered Nurse Safe Staffing Act, a bill designed to ensure sufficient nurse staffing in hospitals.